Ornamental polypropylene UPVC decorative shutters in a variety of colours with the 'rustic look'. Scroll down to see more information on this product. 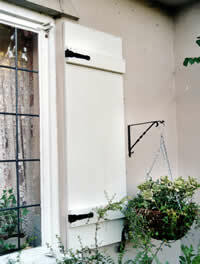 All shutters are supplied with the fixings to install them. 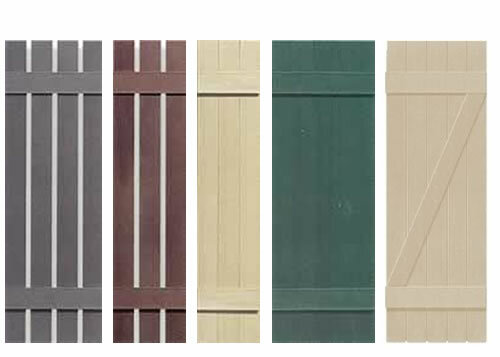 Country Panel images are shown with optional hinge set fitted. Width options available for country panel shutters are 6¾ ” , 10” , 13½ ” , 17” , 20¼ ” , 23¾ ” , 27” and multiples of 85mm (33⁄8”) thereafter. All sizes nominal. Please note that overall shutter widths on the ordering page are rounded to the nearest ¼ inch). Simply Shutters build almost all Country Panel shutter options in our own workshops. As a result we provide a fast dispatch schedule of between 12-15 working days after placing your order (we never count the day the order is placed). We frequently build and dispatch orders much faster than this but as orders are built to client specifications, please allow this period for your new shutters to be constructed and packed ready for dispatch.